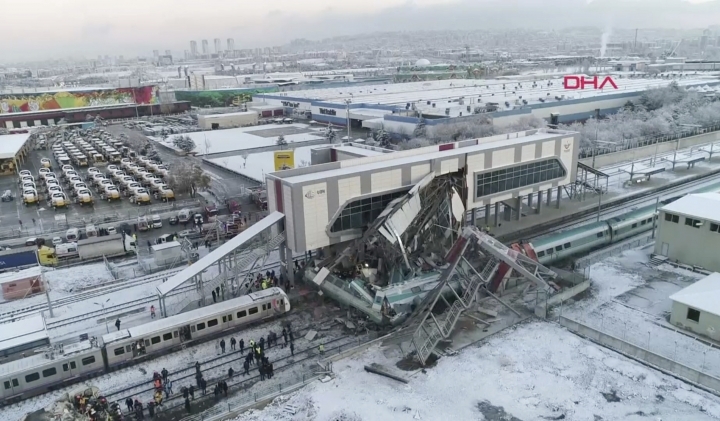 ANKARA, Turkey — A high-speed train hit a railway engine and crashed into a pedestrian overpass at a station in the Turkish capital Ankara on Thursday, killing nine people and injuring 47 others, officials said. 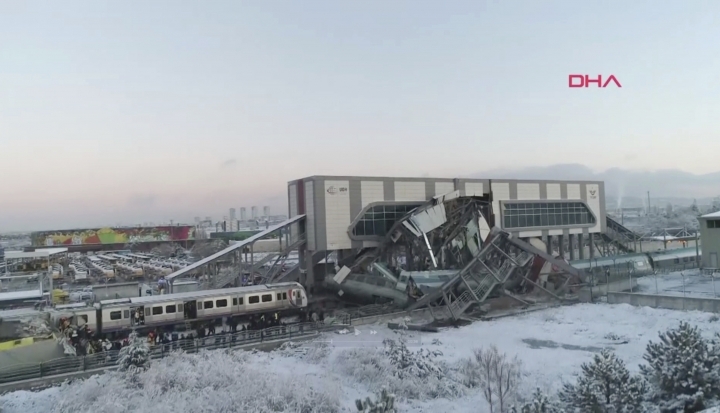 The 6:30 a.m. (0330 GMT) train from Ankara to the central Turkish city of Konya collided head-on with the engine, which was checking the tracks at the capital's small Marsandiz station, Transport Minister Mehmet Cahit Turhan told reporters after inspecting the site. The high-speed train transits that station without stopping. At least two cars derailed, hitting the station's overpass which then collapsed onto the train. Three engine drivers and six passengers were killed in the crash, Turhan said. One of the passengers died of injuries after being hospitalized while others were killed at the scene. Television footage showed emergency services working to rescue passengers from wrangled cars and debris. Hurriyet newspaper said sniffer dogs assisted efforts to find survivors. Turhan said everyone had been removed from the debris and no one else was believed to be trapped. It wasn't immediately clear if a signaling problem caused the crash. Ankara Gov. Vasip Sahin said a technical inspection has begun while NTV television, quoting unnamed officials, said three prosecutors were assigned to investigate. In July, 10 people were killed and more than 70 injured when most of a passenger train derailed in northwestern Turkey, after torrential rains caused part of the rail tracks to collapse. Last month, 15 people were injured when a passenger train collided with a freight train in Turkey's central province of Sivas. Konya, about 260 kilometers (160 miles) south of Ankara, is home to the tomb of the Sufi mystic and poet Jalaladdin Rumi, attracting thousands of pilgrims and tourists. The crash occurred during an annual week of remembrance for Rumi when many travel to Konya to watch Whirling Dervishes perform.